There are times when someone touches your heart in a way that shows how well they know you. 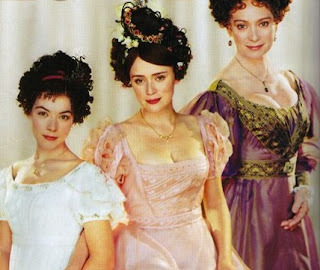 My darling friend, Amy Jo, just sent me the costume drama, "Wives and Daughters." It is exactly what the Doctor ordered. It has been said of this film: "Wives and Daughters is about the ordinary mysteries of life -- where does love come from, how does it grow, how it can twist and sour and corrupt us, how it can break our hearts, how it can bring us happiness and fulfilment. And more than almost any book I know, Wives and Daughters, this neglected masterpiece, tells us what it feels like to be alive. It's so deep and penetrating and has wonderfully convincing characters. Everything springs directly out of their relationships." Davies, who wrote the drama, also believes that "Wives and Daughters was the one where [Gaskell] really hit greatness. It's right up there with Jane Austen and George Eliot. It's got terrific insight and sympathy, and beautifully, subtly drawn characters. It's not as well known as it should be because she never finished it, and so there was always that handicap to calling it a great novel." I first watched it at my parents house, and have had many wonderful conversations with my mom about the plot. I suggested it to Amy, who watched it with her mom. And she knew that this would be perfect for me right now. Friends are the best, and best friends are heaven sent. Thank you Amy, thank you. And, if anyone wants to come over for movie night, I have the DVD!!! I look forward to it on my next visit! I'm a Mormon mom with a darling husband (just look at him! ), a 10 yr old girl, a 6 yr boy, a 2 yr old and a 9 month old baby boy all under one roof. We have a crazy-bonkers life with a whirlwind of laundry, grocery shopping, errands, and keeping up with the general rigmarole. Organization is something I strive for, so that I might find the Holy Grail of "free time." So far, I've only found bits and pieces. I'm not too sure what I want to be when I grow up, but so far all I have is a long list of things I DON'T want to do. So, I bake cookies, wander around in heels n' pearls contemplating what to make my hubby for dinner. Now, if you believe that, you probably don't know me very well. :D Read on . . . I Forgot . . .